The Sky-Watcher EXPLORER-150P is a fantastic choice for intermediate astronomers and also the serious beginner. 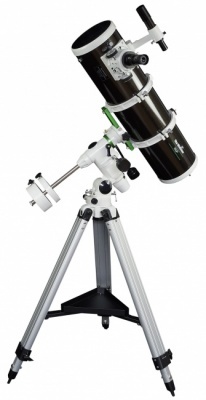 With a large 150mm of light gathering aperture combined with superb parabolic optics, this telescope is a highly capable all-rounder with excellent performance for the observation of the Moon, planets, nebulae, galaxies and star clusters. Supplied with the EQ3-2 equatorial mount or EQ3 PRO SynScan. "Good for advanced observing"....."Saturn was a stunning sight"
"Optical quality good, and this is a good telescope for the amateur. On the EQ3-2 mounting the total comes to £289, and this is excellent value for the serious beginner."